In recent times I’ve been stretching the capabilities of traditional oil painting to the stage where some of my practices are almost unworkable. 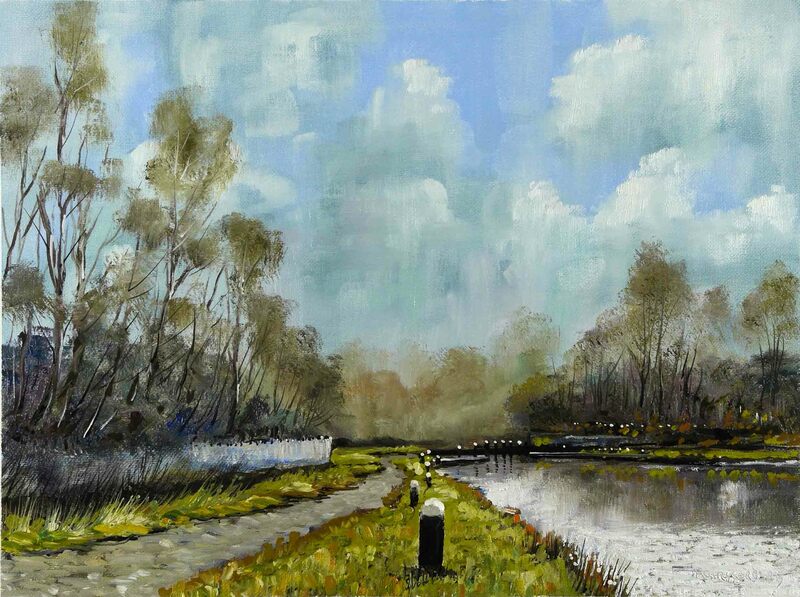 It boils down to this, the medium of oil painting was not designed to be used in this way. Floods of solvent, forced drying with a hair dryer, no added medium, paint messaged and manipulated until it behaves like ink, the expectation of a finished painting in under 2 hours, etc, etc. Add to this the fact that some of what I’ve been doing is downright dangerous and unhealthy. Solvent fumes, heaters, poor ventilation, all while I’m smoking my pipe. Time for a change. I’ve been looking at Alkyd oil paints and I will start to introduce them gradually, firstly with the under layers. The main difference between this paint type and standard oil colour is the binder. Paint is made from pigment, binder and solvent. Standard oils use a vegetable oil as a binder, Alkyd uses a Liquin type material as its binder. The concerns I’ve had with Liquin, since I started using it, were eased a little after my research into Alkyd paints. The technical spec. on Liquin mentioned not using it as a last paint layer especially if the painting was going to be varnished. Without a reason for this recommendation, I assumed there was a danger of Liquin binding to the varnish, especially as it was advised to use a standard oil medium as the final coat or for ‘oiling out’. Liquin and Alkyd binder are similar materials – chemically modified vegetable oil but remaining mixable with the oils from which it was produced. On its own it dries very fast forming an impervious, inflexible layer. These 2 issues will cause problems if this medium is used as a final layer over normal oil paint. Firstly, an impervious layer over a standard oil layer will stop the oxidation of the under layer – the painting will not dry underneath. Secondly, an inflexible layer over a flexible layer will eventually flake off. What this also means is that Alkyd oil colour is an excellent under paint. Inflexible and fast drying. Also, if the under layer is not fully dry and is painted over with standard oil paint it will mix, forming an homogenous layer without the issues caused by separate layers. It looks promising. As usual I’ll document the process and progress. In the meantime here are the videos of the above paintings. If your computer and broadband are up to the task you can run the two simultaneously to see the different methods of painting side by side. See you soon. 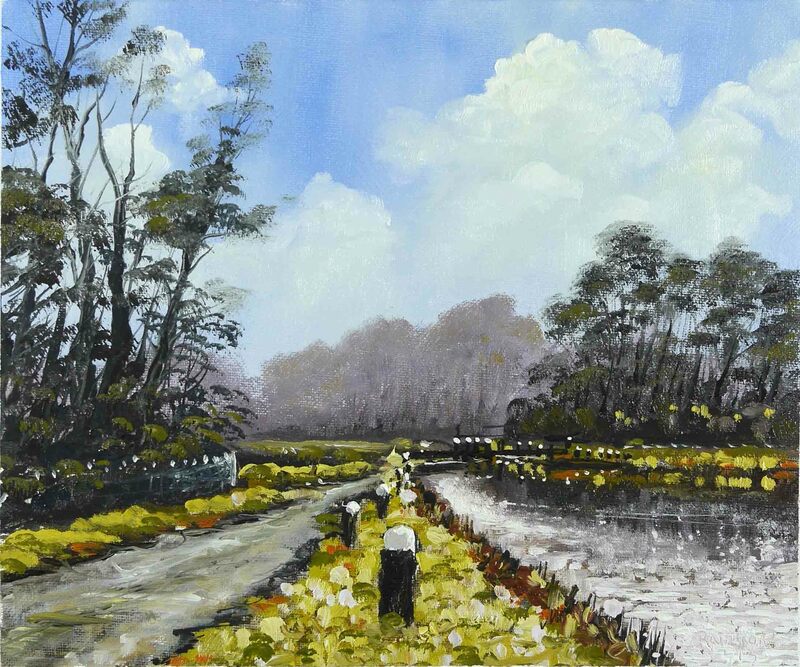 This entry was posted in Oil Painting and tagged Art, Canal, Culture, Education, Inspiration, Irish landscape, Oil Painting, Oil Painting Instruction, Oil Painting Landscape, painting, Pictures, Rock, Sky, Time lapse painting, Trees, Water, winter. Bookmark the permalink. Didn’t know they still made Alkyd paint. I used them years ago, but now I just use the water-mixable oils. I didn’t like the Alkyds at all. But these are great pictures as always. I didn’t know they still made Alkyd paints. I didn’t like them when I used them years ago. I prefer the water-mixable oils. Thanks for the Alkyds and Liquin explanation. I used to use both to speed things up at the end. So that’s why the cracks…never thought to use them at the start. Looking forward to your process with them. As always, wonderful videos. I would have done the same myself but ‘alla prima’ mixes the layers while wet so this saved me from the cracking and flaking. Thanks again.